Ambassador T P Sreenivasan finds the pulse of Pakistan after visiting Islamabad for the first time. 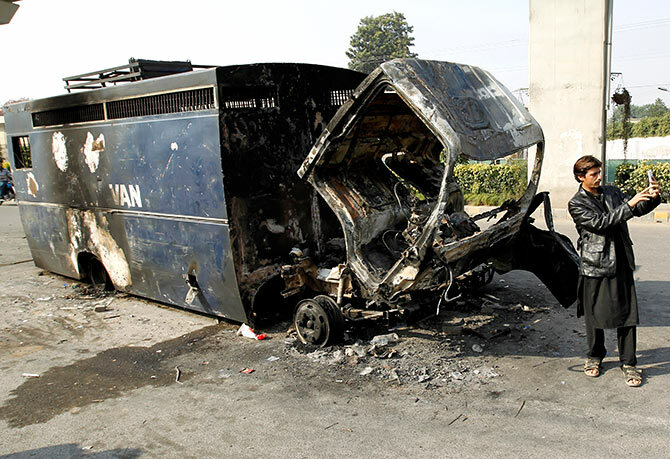 IMAGE: A passerby takes a selfie in front of a police van destroyed during clashes near the Faizabad junction in Islamabad, November 26, 2017. The Tehrik-e-Labaik Pakistan had blockaded the national capital, demanding the law minister's resignation. The Pakistan army brokered a truce between the Pakistan Muslim League (Nawaz) government and the Tehrik; the law minister resigned; many Pakistanis were outraged that the government had caved to the outrageous demands from an Islamist political party. Getting ensconced in the Marriott Hotel in Islamabad for three days to attend a conference is not the way to feel the pulse of Pakistan, but a physical glimpse of the capital for the first time, after having professionally followed the events there for decades, helped me to confirm some impressions and to explode some others. As expected, the country is paranoid with India and is desperately fighting against heavy odds to maintain its rival status in the eyes of the world. The current freeze in relations with India, except for the thrust and parry on the Line of Control, the tough US position on terrorism, and Afghanistan having become an 'extension of India' seem to bother Pakistan's intelligentsia. At the drop of a hat, they would lambast India for having annexed Jammu and Kashmir, using the excuse of a tribal rebellion, for sending Indian forces before the accession was completed and for having forged an Instrument of Accession, which itself has been lost, and for not holding a plebiscite. Indian demands, they would say, would not be acceptable to any self-respecting nation. They have no vision of peace and mutually beneficial relationship with India in the near future. Their expectation is that China and Russia would come to their rescue, now that the US was discarding them. They are optimistic that a Taliban dominated dispensation will wean Afghanistan away from India and bring it to their camp. More of geopolitical involvements, balance of power, friends and masters and overarching presence of nuclear weapons are in the horizon, not peace, cooperation and beneficial and balanced trade. Pakistanis attribute their economic ills to the military control of the civilian government and growth of religious extremism. Qazi argues that Pakistan, despite its poverty and inequalities, does not have a single significant pro-poor or progressive political party. There are only religious, nationalist and populist leaders, who are all right wing, conservative and pro-establishment. He virtually calls for 'a historic struggle to rid Pakistan of rulers without a cause, other than to escape accountability.' He sees the signs of a failing State in every walk of life. The myth that exploded on stepping on the soil of Pakistan was that Pakistan was in some ways comparable to India. Most countries equate India and Pakistan as though there is some parity between them and they are of the same strength and size, because they believe that the two countries are equally responsible for the debacle in Kashmir. The hyphenation that many countries have developed between India and Pakistan is the priceless legacy that Pakistan has acquired because of the internationalisation of the Kashmir issue and other differences. Such a comparison is an existential need for Pakistan as if all disputes were to disappear, the question will arise as to what the justification for Pakistan was. There is no comparison between the two in any area, particularly after the liberation of Bangladesh. Islamabad is only as big as a Delhi suburb with a two million population and broad roads with modest traffic. How can a city with just two five star hotels and only one departure gate at their international airport, named after Benazir Bhutto, be compared to Delhi with its sprawling airport, named after Indira Gandhi? Like the 'parity' between the US and the USSR during the Cold War era, the best kept secret is that there is nothing to equate Pakistan and India except the nuclear capability, which eliminated the military imbalance. Pakistan is many years behind us in virtually everything. The style and sophistication of the Pakistani diplomats abroad had led me to expect a better style of living in Pakistan. The fond hope that the China-Pakistan Economic Corridor and Chinese investment in the country will pull the country out the morass is universal in Pakistan. The country's political parties and regions, however, have been deeply divided on the subject of equitable distribution of and control over CPEC projects. The expectation is that the CPEC will begin to address Pakistan's energy and infrastructure needs in the near term. They expect that the CPEC could prove an opportunity to decisively overcome the Balochistan insurgency. A broader CPEC authority is necessary to ensure that the project moves forward on a consensus basis. Neither the Pakistani military nor the civilian bureaucracy has the economic and political aptitude to steward the project to success. It may well be that the strategic content of the CPEC is being exaggerated. Pakistan's primary goal should be to put itself on a trajectory of rapid, equitable, and sustained macroeconomic growth. The ultimate evidence of the success of CPEC will be whether it boosts industrial productivity, exports, and job creation in Pakistan, putting the country on a path toward sustained, high levels of equitable economic growth. Russia is expected to provide political and moral support to fill the gap being left behind by the United States, when it leaves Afghanistan. The present policy of India to leave Pakistan alone to deal with its problems without chasing a dialogue process and merely dealing with the military situation on the border and terrorism in Jammu and Kashmir appears well-advised. Prime Minister Narendra D Modi appears to have exhausted all his weapons of a peace offensive with Pakistan. Nobody will lament the dormant state of SAARC, as long as modest bilateral cooperation and trade is maintained with our other neighbours in South Asia. In the meantime, what remains is Track II sherpas and other peace merchants who jet themselves to Bangkok and Macao in search of elusive peace. India has more options with regard to Pakistan than Pakistan has with India because our economic development and position in the world are not determined by our relations with Pakistan, which is only a sideshow. But for Pakistan, respectability is contingent upon good relations with India. The United States had wanted India and Pakistan to maintain a dialogue essentially to prevent a nuclear confrontation between them. Pakistan's conditions and terrorist attacks have finally frozen the dialogue and there is no pressure on either country to resume the dialogue. For India, the frustration is on account of Pakistan's refusal to take any action on terrorist leaders, even after clear evidence has been produced about their complicity. The recent decision to allow consular access to Kulbushan Yadav is indeed a welcome development, which may help reduce tensions. The Indian high commission in Islamabad is about to have a leadership change when Ambassador Ajay Bisaria shifts from cold Warsaw to hot Islamabad. These two developments may augur well for the future. But peace cannot come unless Pakistan realises that good relations with India will be more important to them than the illusory parity they perceive in keeping the Kashmir pot boiling. T P Sreenivasan, (IFS 1967), is a former Ambassador of India and governor for India of the IAEA; chairman, Academic Council; and director, NSS Academy of Civil Services; director general, Kerala International Centre.